So an ingredient I have never tried before - Pomegranate Juice. Have you ever tried it. Seems to be one of the new hot things in antioxidants. I liked it, the taste reminds me somewhat of cranberry juice. I was trying to think of something original to make with the juice, so I made a Pomegranate Vinaigrette. In the salad was 1 large chicken breast (I just seasoned with lemon pepper and a little salt, then sauteed in a non-stick skillet), a few tiny bell peppers, about 1/2 c feta, 1 large tomato, and the vinaigrette. Pretty simple, but tasty! *POM Wonderful sent me some pomegranate juice and asked that I make up a recipe using it. It was a fun and delicious experiment! What a brilliant idea to replace most of the vinegar with POM! Love it! 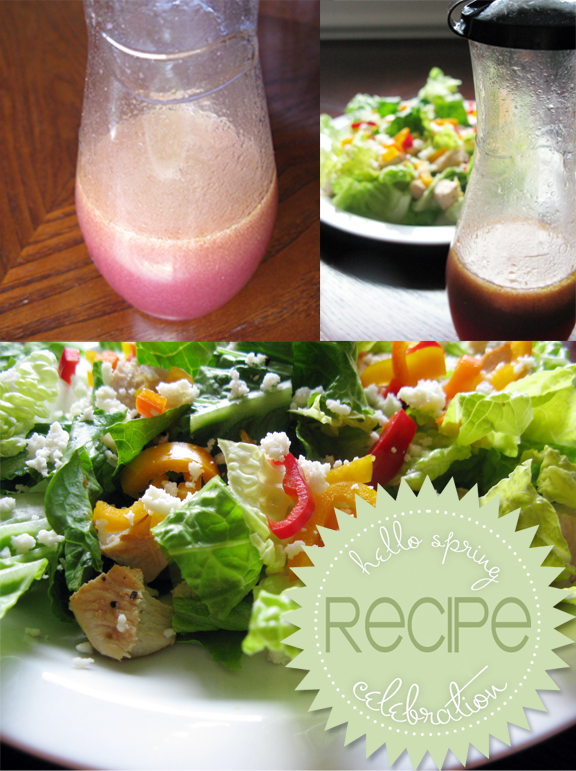 This would be fabulous on greens as well as fresh fruit! I love to add pomegranate seeds to my salad. I bet they would go perfectly with your pomegranate vinaigrette. Yummy Sarah! You do the best job with your pictures.